This isn’t something you see very often. An extremely rare Shelby GT500 Super Snake Prudhomme Edition will cross the auction block at the upcoming Mecum 2017 Las Vegas auction. This Snake is coiled and ready to strike! Its venom comes in the form of a 5.4-liter V8 spewing 800 horsepower. And with only 490 miles on the clock, it probably goes without saying these miles were racked up a quarter mile at a time. 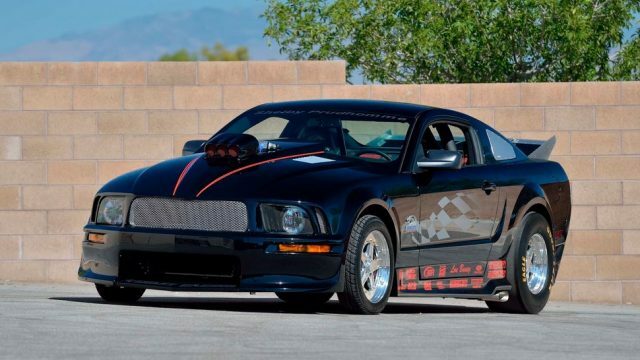 This serpent also includes a short throw 6-speed manual transmission, Borla exhaust, and Ford Racing 8.8-inch rear end. This snake slithers across the auction floor on November 18th. For more info, check out mecum.com.